Larry and Edith Ethridge made some wonderful memories in their family home: they hosted what felt like the entire freshman class from University of Georgia for the Kentucky Derby, cooked family dinners, celebrated holidays, invited friends in and created their life in between those walls. But, after nearly 40 years in their Cherokee Triangle home in Louisville, they began toying with the idea of downsizing. Larry had six back surgeries and Edith dreaded taking the laundry to the third floor of the 120-year-old house. Plus, she hated the thought of leaving a home full of things for their children to have to clean out someday. They wanted to make a move before safety became an issue, but had trouble determining their next step. Edith spent three years trying to find a house that would allow them to downsize to single-level living, with fewer rooms and a smaller yard. “We started looking for a place where we would be safe,” Edith remembers. She looked in the St. Matthews neighborhood of Louisville, known for its smaller, ranch-style homes, but everywhere she turned she could only see the still-looming problems with home repair, trash removal and yard maintenance. “We realized it wasn’t just about being on one floor, but it was more about the lifestyle,” said Edith. But then, a dear and trusted friend—who happened to be Kristy Hubert, Marketing Director at Meadow and Miralea Active Lifestyle Communities—told them about Meadow, which was just beginning construction. 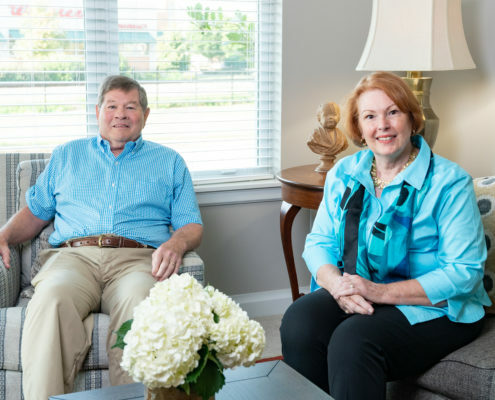 With only floorplans and renderings to help them envision what their new home would look like— “Talk about having faith!” said Edith—the pair signed up and began looking forward to everything that awaited them when construction completed nearly two years later. After one more champagne toast and Mary Tyler Moore-esque hug in their old living room on Longest Avenue, Edith and Larry became the first residents to call Meadow Active Lifestyle Community home on July 2, 2018. Now settled into their new home, Larry and Edith enjoy sharing it with others. “The biggest surprise when we moved into Meadow was the luxury,” said Edith. In fact, when showing their friends their new home, one remarked that it looked like something you’d see in New York. “It has been fun to entertain our friends here,” said Edith. “We go to the Palette restaurant where we treat them to dinner. It’s an easy way to be hospitable” –without the cooking or cleaning, of course. When not entertaining friends, you can find the Ethridges entertaining family and sitting on their back porch to watch the trains go by. Larry’s dad was a railroader on the Louisville and Nashville Railroad, and they have L & N train hats for their grandkids, ages 6, 4, 2 and 3 months, who can’t wait to wave at the engineers. 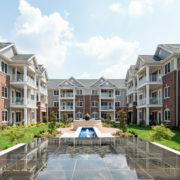 The Ethridges have been impressed by the ease of living here, even during the move-in process. “If I needed a doorstop, I turned around and there was one ready for me,” said Edith. They also love that the trash drop is around the corner, not at the end of a long, sloped driveway, and that storage is down the hall and not down the stairs. Now, the Ethridges don’t give any thought to cleaning, maintenance or upkeep. They attest that their anxieties and concerns for the future have dissipated tremendously. They only need to worry about whether their grandkids will make it over in time to wave as the trains go by on the tracks at the edge of the campus.